How to be, where to be, in a space, with sound, with other bodies? For me, in relation to what performance is becoming, this has been the biggest question of the past year. What does it mean to hear? What does it mean to be present, in relation to others (close proximity), to see, to perceive the temperature and extent of a space, to feel surfaces (floor, chairs, the pressure of sound) in relation to the body? What does it mean to be arranged in a formation, either as performers or audience? How can we change orthodoxies that have become so deeply embedded in the social ritual of performance, particularly when performance is becoming something other than performance? The only chair I could find at Cafe Oto was at the far end of a crescent, in the negative centre of which lay a dark void. 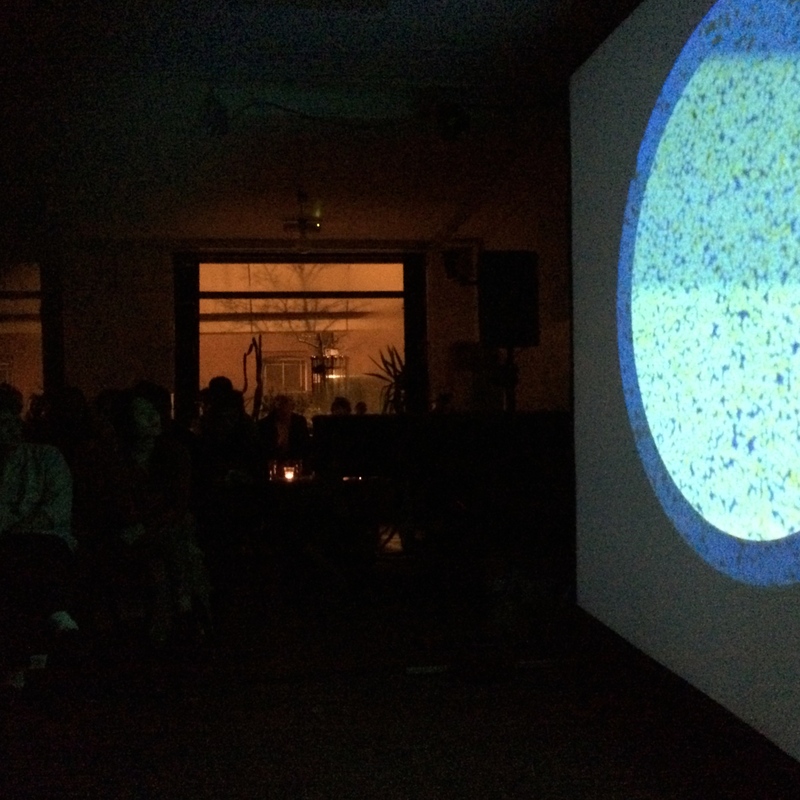 Cranc, the performers, had arranged themselves at the deepest part of the arc: Rhodri Davies with horizontal electric harp, Benedict Drew with mini-synth, laptop and projector, Nikos Veliotis with custom amplified cello, pre-amp and bass amplifier, Angharad Davies with amplified violin. They worked in darkness, facing Drew’s projected film, a flat screen that closed off the empty segment of the crescent. For the first piece of the evening they began without projection – long tones, initially across a wide range of pitches but quickly converging on middle to low. The dominant tone, from cello, settled itself in a bandwidth that opened up the question of hearing. By lifting a paper mask from the projector lens, Drew created a new focal point, a circle of light and colour in which small lines reacted as if under intense stimuli. Those sitting close to me directed their eyes to this circle, as if drawn there by hypnotic compulsion. I did the same but was distracted by my perception of this dominant tone, a ‘hearing’ that was felt in the jawbone primarily. As Veliotis changed the timbre and frequency it moved up into my cheekbones, then down into the softer tissue between chin and breastbone. This was precise resonation – ‘skin and bone’ listening – in which the ears played very little part. The specificity of seeing and the processing of conscious thought that goes with it seemed externalised, embodied even, by these small particles, creatures of line and colour, dancing on the screen; it was possible to find a bridge between the screen – a kind of raw active life – and the particularity of the violin’s confident long tones and agitations. The amplification of the violin was clearly audible in my right ear, the acoustic violin in my left, so my gaze was pulled slowly back and forth, to watch an action (in the semi-darkness, where player sat in close proximity to audience), to hear its consequence (and so to see the screen, in close proximity to loudspeaker). Slightly discomfited by this swaying motion and the vibration of my lower skull, I settled an uncertain gaze on the window ahead of me, a misted rectangle whose upper part was divided by the canopy outside, winter shadow of a skeletal tree projected on its canvas ‘screen’ by street lights, its lowest edge undulating gently in the wind. Any connection to the music was coincidental yet here was another site for visual perception, opening up correspondence at a different level, slower, less specific, drifting rather than teeming and so reflecting the way the music slid through frequency and timbral spectra. To use a detestable shorthand, this was drone music, a genre (if that’s what it is) with which I have lost much of my patience. The excitement I experienced when hearing The Velvet Underground and Nico in 1968 or buying La Monte Young’s so-called black album in the early 1970s has been vaporised by hearing too many men in black hunched over electronic equipment in the gloom, pouring out long tones of indifferent interest. Yet there was an improvising sensibility and musicality in this group, a recognition that drones should not be a strategy simply to establish and sustain safe ground through fixity. Thin tendrils of distortion drilled into the core, wisps of feedback sparked off the substrate. There was perpetual movement and in the second section of the evening, moments in which all cohesion was lost, in which the whole piece threatened to subside, maybe collapse. By this point the room felt lighter, the audience less tightly packed, the void less empty. The involuntary poetry of the window remained as a reminder that the boundaries of performance extend beyond its physical perimeter. 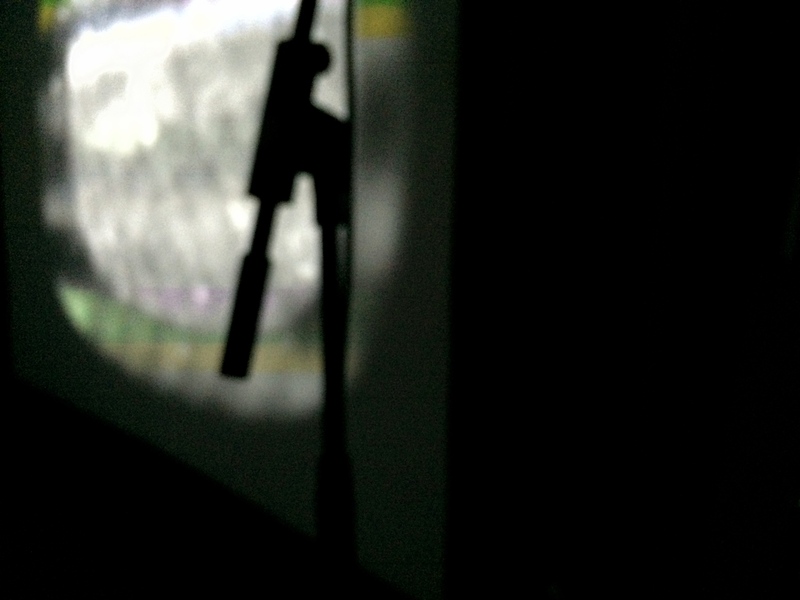 Cranc were live at Cafe Oto, London, 14.12.2014. 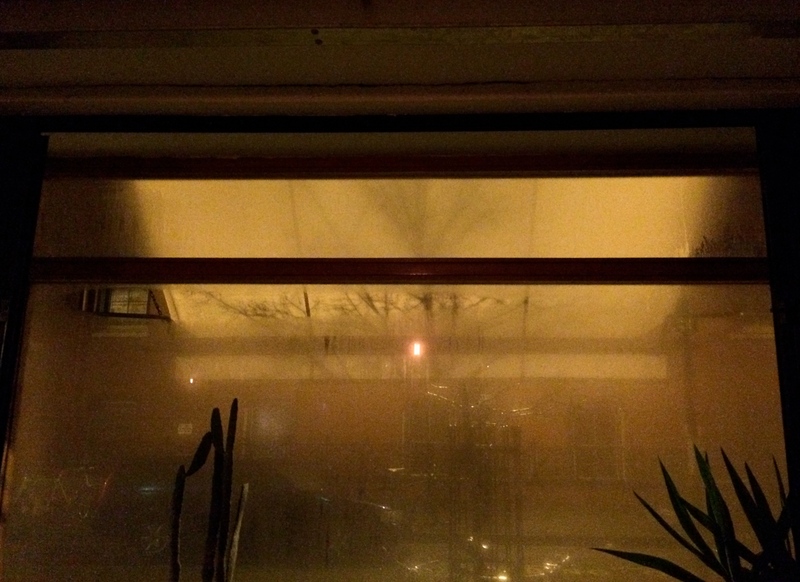 This entry was posted in into the maelstrom, live sound and tagged Angharad Davies, Benedict Drew, Cafe Oto, drone music, improvisation, La Monte Young, listening, Nikos Veliotis, Rhodri Davies, Velvet Underground. Bookmark the permalink. It’s no easy feat to describe this kind of music in general, or in ‘detestable shorthand’, maybe because there is so much of it that lacks that substance. I felt like I was there, well done! I play music primarily by ear and have been going to shows since the late 80’s and always made a point to move around the room taking note of how the sound moved around in both crowded and not so crowded venues of all sizes. This is an important aspect of making music, listening more! Thanks for the refreshing, engaged and intelligent perspective! Moving around the room is one of the best ways to listen, don’t you think? I concur, unless it’s too crowded to move around, at least find the sweet spot! Moving out of the room is good too…. Hahah, yes, quite often the best option.